Metallica is just everywhere these days. Guitar Hero: Metallica was released this week, this weekend they'll be inducted into the Rock and Roll Hall of Fame, they are in middle of European Tour for Death Magnetic and have announced another leg for the US this fall and winter. I got my copy of Guitar Hero: Metallica yesterday and was amazed. Once their normal entrance music of "Ecstasy of Gold" started, I got chills just like I was at live show. The game play is fantastic and features all the stages and tours through Metall-istory. Even playing along with animated versions of James, Lars, Kirk and Robert I'm nervous and thrilled. This is first music game I could be playing guitar and singing at the same time from the first moment I start playing. 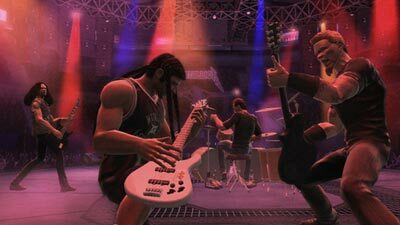 The only thing I wish the game had was seeing Metallica as they were for each era - would love to see the long haired metal monsters of the 80's and 90's plus having Cliff be in the game would be fantastic. Maybe such things show up later as I play - who knows. I'm seeing Metallica in Germany on May 9th. I'm beyond psyched for my first international show. US dates for the rest of 2009 have been announced, but don't include anything in New England - a big shock since they only played one date in Boston on the first leg. Normally they play Boston, Providence, Hartford and Worcester. That can only mean 2010 will be featuring many visits, I hope. The R&R Hall induction goes down Saturday, April 4 and will be covered live by FUSE TV. In fact FUSE is doing a week long of Metallica specials. The ceremony will be live from Cleveland on Saturday, April 4 starting at 9:00 pm EDT. Don't have FUSE? No biggie - you can watch it online! Check out www.fuse.tv/rockhall for more info. and the schedule for the week is also posted here. Metallica is bringing EVERYONE to celebrate the induction - very cool. Jason Newsted will even take over as bassist for the day!